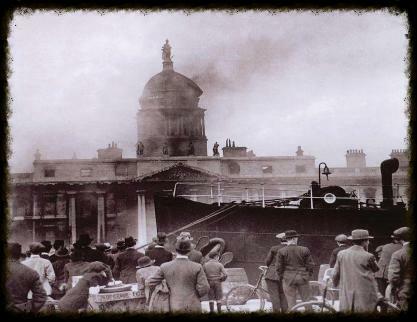 The burning of the Custom House on 25 May 1921 was a seminal event in the course of the Irish Revolution. The author admits to having become fascinated with the planning and carrying out of this operation. His own special interest lies in both Irish fire service history and in the history of the revolutionary years in Ireland from 1912-23. In studying the planning, carrying out and aftermath of the Custom House attack those interests converge. ‘Dublin Fire Brigade and the Irish Revolution’ published in 2012 by South Dublin County Libraries. In the few short years since then an amazing amount of previously unavailable information has come to light through the opening up to public scrutiny of the 1934 Military Service Pensions Act applications and statements. Republican Army or the Irish Citizen Army. 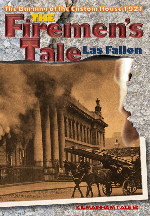 In order to fully explore the role played by these men and by Republican sympathisers within the Dublin Fire Brigade in the burning of the Custom House, the author felt that this book was justified, as it was an event where these men became active participants rather than just facilitating attacks on British government property and on the Crown Forces. and the members of the Squad and ASU in conjunction with other IRA units throughout the city. This short book does not presume to tell that part of the story – instead, this is The Firemen’s Tale. Las Fallon has been a fire-fighter with Dublin Fire Brigade for three decades, and has an interest in early Irish fire services (including 18th Century insurance company fire brigades) and in the early years of the Dublin Fire Brigade, as well as a special interest in the Brigade’s role during the revolutionary years. "Pleasant surprise in today’s mail, thanks. I made the mistake of collecting it from the box on my way OUT to run some errands. Realizing what it was, I opened the envelope and scanned the book at every stop sign and red light…literally couldn’t put it down. Once home, I put it on the top of my pile of current readings and, an hour or so ago, got the time to read it. 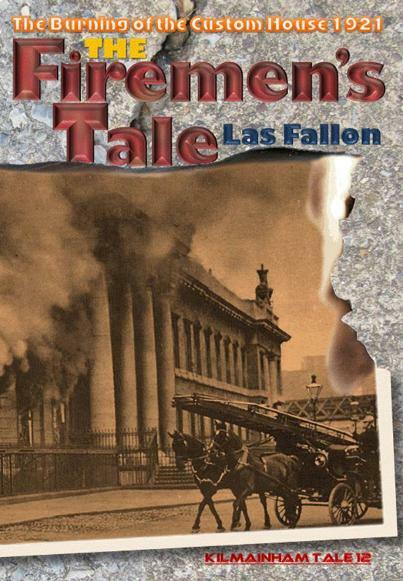 “The Firemen’s Tale” is a gem of a book; a great tale well told…expanding an episode from [the author's] first book with greater detail and new revelations. And, as good as the writing and story-telling are, I’d venture that as much scholarly research went into tracking down and identifying the many photos that illustrate the book. The design and illustrations are incredibly well done, and make the book a joy to look at, as well as to read. The realization of what it took to bring this amazing story to light shows the fine line between history and detective work…especially on a 94-year old 'case'." "You have made outstanding use of the Military Archives material, especially the Pensions files and, combined with your own expert knowledge of the fire service, it is a model template for the rest of us. I know it is frustrating to get info too late but I would have written different books on Dublin if the pension files had been released earlier. This is a piece of work you can be very proud of".